Kason's Circular Vibratory Fluid Bed Processing System dries small batches of bulk solid materials at high-temperatures. The self-contained system integrates an 18 in (457 mm) diameter fluid bed processor with heater, blower, cyclone separator and controls on a frame, ready for connection to a material inlet/outlet and power source. 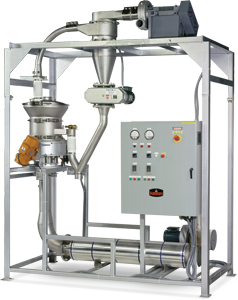 Intended for small volume production and laboratory/pilot plant testing, the system dries batches up to one cu. ft. (28 liters). At the end of each drying cycle, a valve at the spout of the fluid bed chamber opens automatically to evacuate the batch. The system includes an optional high temperature package that allows drying at temperatures up to 600° F (315° C). Fines entrained in the exhaust air are collected by an optional cyclone separator and returned to the stream of dried material at a "Y" fitting. At less than half the size and weight of rectangular fluid bed processors of equivalent capacity, the circular fluid bed unit allows all primary system components to be consolidated on a shippable frame. Inherent strength of the circular processor eliminates the need for heavy gauge walls and cross braces otherwise required to withstand continuous vibration, allowing vibratory motors to be downsized. The circular unit also requires only one air inlet and outlet and has fewer weld seams, reducing overall size and construction cost, especially when finished to 3-A, FDA, and BISSC sanitary standards. Cleaning time is cut by more than 50 percent due to the reduction in interior seams, and accessibility afforded by a quick-disconnect housing. The dryer is the smallest of eight models ranging in diameter from 18 in to 84 in (460 mm to 2135 mm), encompassing batch and continuous applications from low-capacity laboratory and pilot plant testing to high-volume production. All are available configured for drying/heating, cooling or moisturizing applications.